The California grizzly (Ursus arctos californicus) is an extinct subspecies of the grizzly, the very large North American brown bear. "Grizzly" refers to the golden and grey tips of its hair. Genetically, North American grizzlies are closely related; in size and coloring, the California grizzly was much like the grizzly of the southern coast of Alaska. In California, it was particularly admired for its beauty, size, and strength. Many accounts from pioneers describe grizzlies in long, bloody fights with angry longhorn bulls, and often winning. The grizzly became a symbol of the Bear Flag Republic, a moniker that was attached to the short-lived attempt by a band of American settlers to break away from Mexico. Later this rebel flag became the state flag, and then California was known as the "Bear State." In 1866, a grizzly weighing 2,200 pounds (1,000 kg) was killed in Valley Center, California, the biggest bear ever found in California, unsurpassed until John Lang shot the world's biggest bear — 2,320 pounds (1,050 kg) — near his ranch by Canyon Country, in 1873. California still has habitat for about 500 grizzlies, and if the North Cascade population recovers and expands, it may be introduced to California. There are, however, only about 20 of these bears remaining in that ecosystem. In 2014 the US Fish and Wildlife Service received a petition to reintroduce the grizzly to California. This reintroduction would be from the very closely related Rocky Mountain grizzly. A Kodiak bear, nearest living kin to the California grizzly, despite its humpback. "The specific status of North American grizzly bears is one of the most complex problems of mammalian taxonomy. The difficulty stems directly from the work of Merriam (1918), who concluded that there are 86 forms of grizzlies (and brown bears) in North America." Later, all North American grizzlies were scientifically grouped together as one unique species until DNA testing revealed that they should properly be grouped taxonomically in the same species as the other brown bears. Californian grizzlies were classified by Merriam into many species and subspecies but today the only subspecies is the ABC Islands bears. 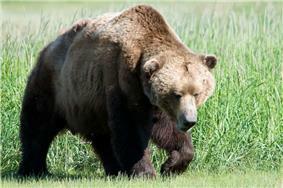 All brown bears in North America are also known as Grizzlies and the California Grizzly is classified Ursus horribilis. 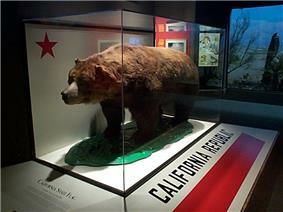 The California grizzly is one of the state’s most visible and enduring symbols, adorning both the state flag and seal. The Bear Flag first flew in 1846 as a symbol of the short-lived California Republic. A second version was adopted as the state flag by the state legislature in 1911. The bear symbol became a permanent part of the state seal in 1849. The California Grizzly was designated the official state animal in 1953. The bear is celebrated in name and as mascot of the sports teams of the University of California, Berkeley (the California Golden Bears), and of the University of California, Los Angeles (the UCLA Bruins) and in the mascot of University of California, Riverside (Scottie the Bear, dressed in a Highland kilt). The California Maritime Academy operates a training ship named "Golden Bear". The first recorded encounters of California grizzlies by Europeans are in the diaries kept by several members of the 1769 Portola expedition, first exploration by land of what is now the state of California. Several place names that include the Spanish word for bear (oso) trace their origins back to that first expedition (e.g. Los Osos). As the settled frontier of New Spain was extended northward, settlers began to populate California and establish large cattle herds as the main industry. The grizzly bears killed livestock and so became enemies of the rancheros. 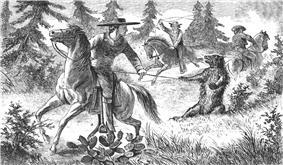 Vaqueros hunted the grizzlies, sometimes roping and capturing them to be displayed in public battles with bulls. This popular spectator sport inspired betting as to whether the bear or the bull would win. One popular, though false account is that Horace Greeley, after seeing such a fight, gave the modern stock market its "bear" and "bull" nicknames — based on the fighting styles of the two animals: the bear swipes downward while the bull hooks upward. Less than 75 years after the discovery of gold in 1848, almost every grizzly bear in California had been tracked down and killed. The last hunted California grizzly was shot in Tulare County, California in August 1922. Later, in 1924, a grizzly known to roam an area of the Sierra Madre Mountains (Santa Barbara County) was spotted for the last time, and thereafter, grizzlies were never seen again in California. In 2014, the US Fish and Wildlife Service received and rejected a petition to reintroduce the California grizzly. ^ Storer, T.I. ; Tevis, L.P. (1996-12-27). California Grizzly. Berkeley, CA: University of California Press. p. 335. ^ a b "Valley Center History Museum". Retrieved 2012-05-05. ^ "Santa Clarita Signal". Retrieved 2013-08-02. ^ Carroll, C., R. F. Noss, N. H. Schumaker and P. C. Paquet (2001). David Maehr, Reed F. Noss, Jeffery L. Larkin, ed. Large Mammal Restoration: Ecological and Sociological Challenges in the 21st Century (1 ed.). Washington, DC: Island Press. pp. 25–46. ^ Morgan, Chris P.; Davis, James; Ford, Tim; Laney, Nan (2004). "Promoting understanding: The approach of the North Cascades Grizzly Bear Outreach Project" (Ursus 15(1) Workshop Supplement:137-141). ^ Miller, C., Waits, L. & Joyce, P. (2006). "Phylogeography and mitochondrial diversity of extirpated brown bear (Ursus arctos) populations in the contiguous United States and Mexico." 15 (14). pp. 4477–85. ^ Rausch, Robert L. (1953). "On the Status of some Arctic Mammals.". Faculty Publications from the Harold W. Manter Laboratory of Parasitology. Paper 497. Journal of the Arctic Institute of North America (July 1953) 6(2). 6 (2). ^ Trinkle, William J. (4 August 2013). "A Brief History of the Bear Flag". The Bear Flag Museum. Sacramento, CA USA. Retrieved 7 May 2014. The flag soon came to be called the “Bear Flag” and the insurgency came to be called the “Bear Flag Revolt"
^ "History and Culture - State Symbols". ^ Storer & Tevis (1955). California Grizzly. UC Press. ^ "Bull, n1 III.8.a." OED Online. Oxford University Press, December 2014. Web. 20 January 2015. ^ Grinnell, J.; Dixon, J.; Linsdale., J. (1937). Fur bearing animals of California. ^ "EDITORIAL: Grizzly bear homecoming?". Fresno Bee. 2014. Retrieved 28 September 2015. Wozencraft, W.C. (2005). "Ursus arctos californicus"Subspecies . In Wilson, D.E. ; Reeder, D.M. Mammal Species of the World: A Taxonomic and Geographic Reference (3rd ed.). Johns Hopkins University Press. p. 589. San Francisco, California, California Gold Rush, San Diego, Washington, D.C.